So the idea was born but then the next question was how do I make them? After quickly rereading “The Cat in the Hat”, I went up to the nearest dollar store to see if I could find a bunch of suitable teapots to put the fish in. Instead I found these really cool topsy turvy fishbowls for $2 each. Step one, complete. While up at the dollar store, I also found a pack of 20 ‘cup and stick’ balloon holders ($1). The ‘sticks’ would work perfectly for the stems of the ‘flowers’, and the cups were perfect for building the flowers around. As luck would have it, I had a stack of orange and yellow paper kicking around my house (this would also come in handy for the ‘gift card’ box – but more about that after the centerpieces). 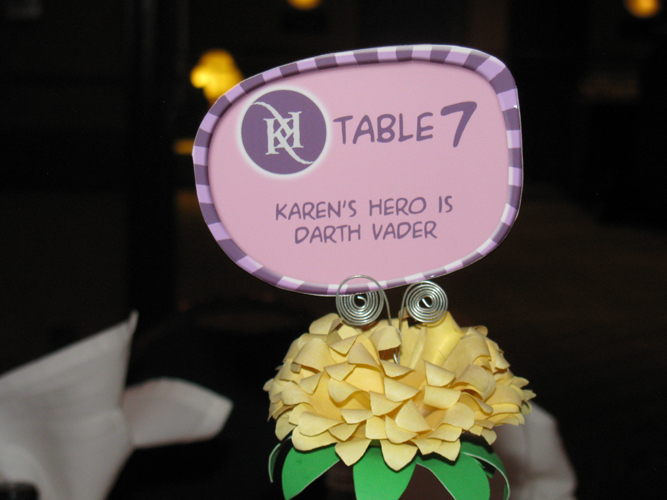 When I started making the centerpieces, the most tables we could have would have been 15 (including the head table). So I bought 16 fishbowls, and with the 20 balloon holders, I had a little room for error. So I figured I’d just build a flower with no planning, out of the yellow paper, and see how it looked. It turned out better than expected, so I fine tuned the design a bit, and made 16 flowers. 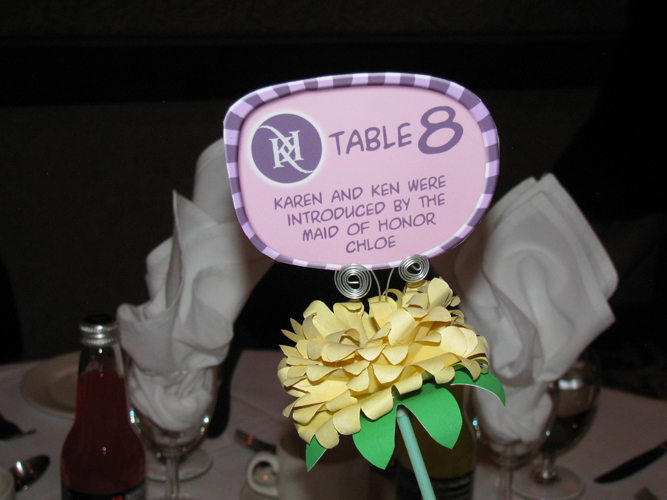 The flowers had 6 layers of paper petals, with two silver wire stamen to hold the card that would show the table number and have a bit of Karen and Ken trivia. The flowers actually looked quite good, but the balloon sticks were white. So to fix that, I took an eye dropper and poured green ink through the stick to give it a green tint. Now to build the fish. I feel a little silly on my first try at the fish. Let’s just say it wasn’t a complete success. I went to Deserres and bought a package of polymer clay (Sculpey). 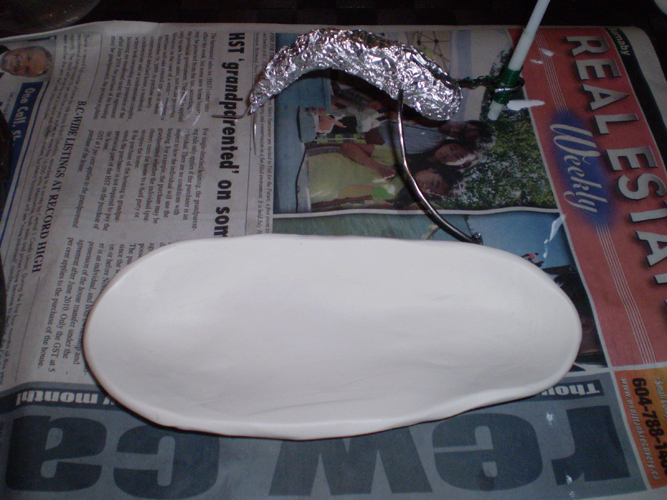 I knew I had to make the clay go as far as possible, so I built an aluminum foil substructure to mold the clay over. Here’s where I made my first mistake. I didn’t put wire on the skeleton for the arms/fins. The arms were breaking before I even baked the clay in the oven. …ah…baking the clay in the oven, where I made my second mistake. There’s a reason Karen kicked me out of the kitchen, I can’t even bake clay. I misread the instructions, and baked the clay at the wrong temperature (not high enough). 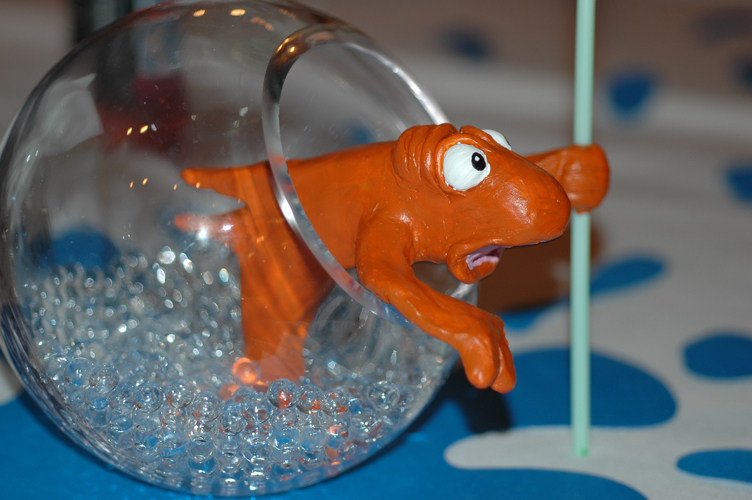 The first set of fish basically shattered…unfortunately this included the fish my niece had come over to help me build. By the time I realized what I was doing wrong, I had wasted more than a few hours trying to get the fish to work. I had no choice but to throw those ones out. But now I had realized the weak points, and had refined and improved my design. I started the new set of fish focusing on the hand that holds the flower. I took one of the balloon sticks and cut it down to about four inches long, to make it easier to work with. Then I wrapped a few layers of scotch tape around it, so the wiring in the next step allowed a little room for the stick to slide in and out. 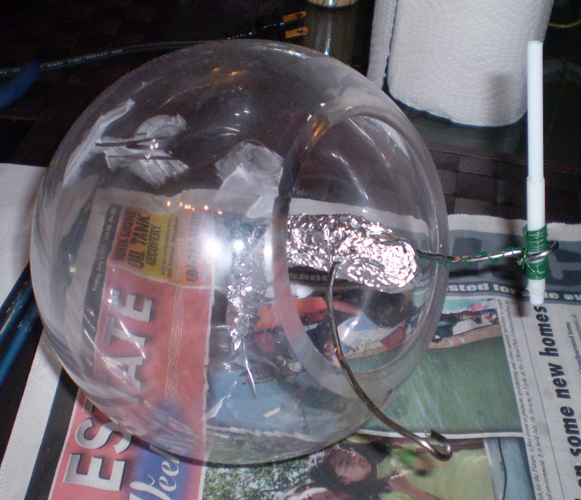 Then I wrapped a fine wire around the straw, so that I could build the fish’s hand around it. You can see the green wire in the picture below. 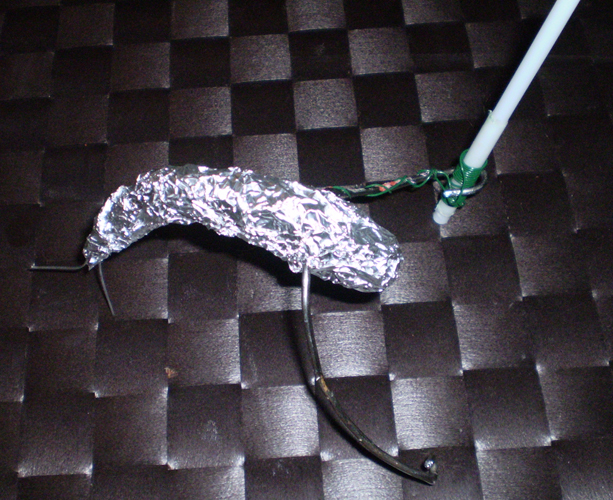 Then I built a rough aluminum foil body, with wire arms, and wire tail. At this point I had learned a few things from my past mistakes. Next I stuck the fish into a bowl, just to make sure he was going to sit properly. Next I rolled out a ball of clay and I’m finally ready to start sculpting the fish. …but that’s for tomorrow and part II! would be great if could order some of these! Just wondering about fish in bowl. Making my kid a cat in the hat theme party and I love what you done. I’m wondering if you sell them? Unfortunately I don’t sell them. I only made enough for our wedding tables.